OAKLAND, CA—The revelations that led to this week’s resignation of World Bank Chief Economist Paul Romer point to flawed methodology and political manipulation in the World Bank’s Doing Business report. Romer admitted that the Doing Business rankings may have been manipulated to make Chile’s economic environment look worse under the sitting socialist president Michelle Bachelet. These revelations add to a long list of concerns that have been raised by civil society in recent years. The Our Land Our Business campaign was launched in 2014 to demand the end of the Bank’s Doing Business rankings. Over 280 organizations, including NGOs, unions, farmers, and consumer groups from over 80 countries have joined this call so far. The Doing Business ranking is today’s version of the Structural Adjustment Programs (SAPs) that devastated the livelihoods of millions in the developing world through the withdrawal of state intervention and the forced liberalization of national economies in the 1980s and 1990s. Since 2002, the World Bank has scored countries according to how well their governments are improving the “ease of doing business,” encouraging a race to the bottom of deregulation between countries. In 2013, the World Bank’s own independent panel recommended that the country rankings be eliminated and the tax indicator, which penalizes countries that require private companies to pay taxes or make contributions to pensions and other social protection schemes, be removed from the Doing Business reports. The Bank management ignored these recommendations. Instead, while the developing world has faced a new wave of land grabbing for large scale agriculture following the 2007-2008 food crisis, the Bank doubled down on its fetish for rankings by introducing a new program, at the demand of the G8, called “Enabling the Business of Agriculture” (EBA) in 2014. Adapting the model of the Doing Business indicators to the agricultural sector, the EBA’s goal is to promote measures and reforms that will favor the corporatization of agriculture, including increased industrial agriculture and the privatization of seeds around the world. 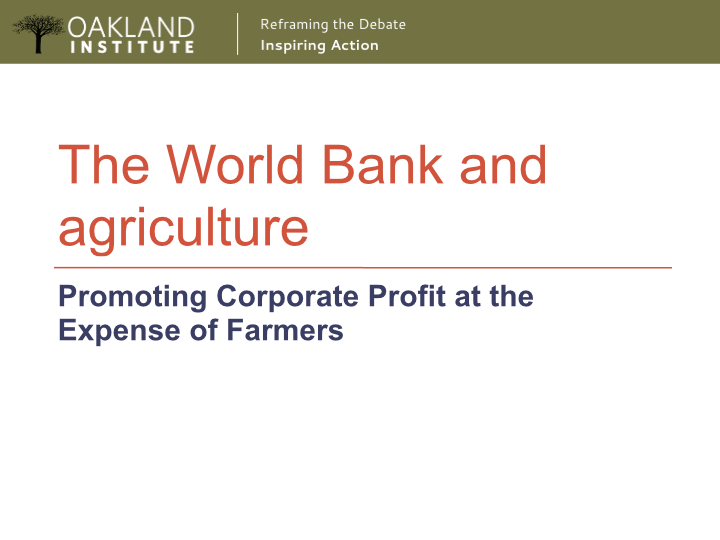 “Instead of supporting local economies, including family farms by ensuring secure and durable access to land – key to the economic, social and environmental future of many developing countries, the Doing Business ranking and the new Enabling the Business of Agriculture program are pushing governments to hand away their countries to private interests,” said Anuradha Mittal, Executive Director of the Oakland Institute. “In light of the latest revelations of political manipulation orchestrated by the World Bank, governments around the world must take action and demand that the World Bank immediately end its business rankings,” she continued.